NETWORK FINALS: ELLEN’S GAME OF GAMES and THIS IS US gained 0.1 in final numbers, while THE VILLAGE and the rerun of ROSWELL, NEW MEXICO lost the same. CABLE HIGHLIGHTS: History’s CURSE OF OAK ISLAND led Tuesday cable, down 0.05 to 0.74, with THE LOST GOLD OF WW II down 0.04 to 0.34. On USA, WWE SMACKDOWN dipped 0.08 to 0.71, with the season premiere of MIZ & MRS at 0.41 (down 0.17 from the July 2018 premiere), and GROWING UP CHRISLEY at 0.25. TNT’s NBA doubleheader was at 0.60/0.42. Bravo’s REAL HOUSEWIVES OF BEVERLY HILLS ticked up to 0.53, and MEXICAN DYNASTIES was down 0.05 to 0.11. Lifetime’s MARRIED AT FIRST SIGHT rose 0.06 to 0.42. 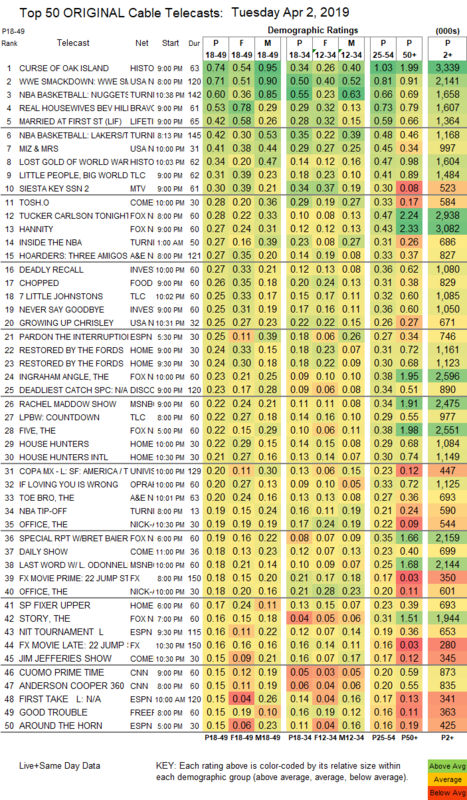 The official season premiere of TBS’s THE LAST OG isn’t on the chart because it was listed as a rerun, having run as “sneaks” after some NCAA games, but it was at 0.40/1M. TLC’s LITTLE PEOPLE, BIG WORLD returned at 0.31, with 7 LITTLE JOHNSTONS at 0.25. MTV’s SIESTA KEY was steady at 0.30. On Comedy Central, TOSH.0 ticked up to 0.28, and THE JIM JEFFERIES SHOW ticked down to 0.15. Fox News’s TUCKER CARLSON TONIGHT led cable news at 0.28/0.47/2.9M, with MSNBC’s RACHEL MADDOW SHOW at 0.22/0.34/2.5M, and CNN’s CUOMO PRIME TIME at 0.15/0.20/900K. A&E’s HOARDERS lost 0.04 to 0.27, and THE TOE BRO was down 0.02 to 0.20. On ID, DEADLY RECALL slipped 0.02 to 0.27, and NEVER SAY GOODBYE was at 0.25. Food Network’s CHOPPED ticked up to 0.26. 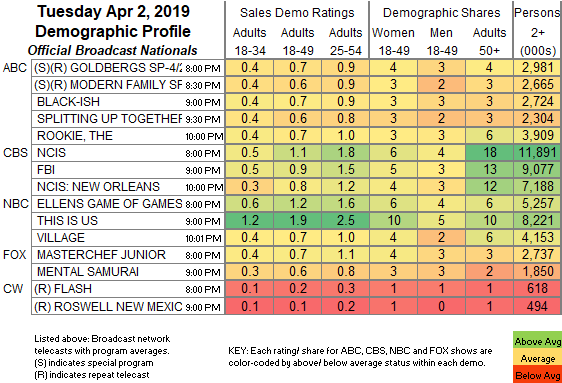 On HGTV, RESTORED BY THE FORDS was at 0.24/0.24 compared to last week’s 0.20/0.20, with HOUSE HUNTERS at 0.22 compared to last week’s 0.31/0.25/0.21, and HOUSE HUNTERS INTL down 0.06 to 0.21. Discovery’s THE DEADLIEST CATCH returned at 0.23. OWN’s IF LOVING YOU IS WRONG was at 0.20. The season finale of Freeform’s GOOD TROUBLE was up 0.02 to 0.15. On BET, the just-renewed AMERICAN SOUL was steady at 0.12, and BOOMERANG was up 0.02 to 0.11.